Cambridge township was established in 1869, the year that Ira Conger and D. G. Miller filed the first plat of the town at its present site. 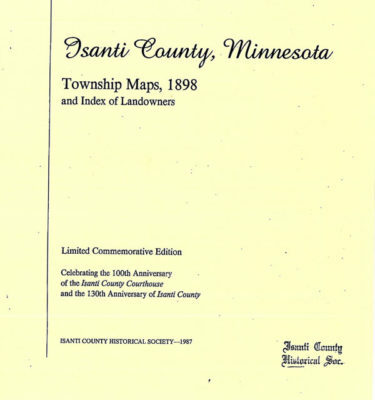 It was also in that year that the decision was made to locate the county courthouse in Cambridge rather than Isanti. During the early years of the county before there was much permanent settlement, the entire area was referred to as the Cambridge Precinct mainly because the only post office was at Cambridge. The township is divided by the Rum River. Before there was a bridge at Cambridge, ferries were operated by Ira Conger and B. L. Gifford. The areas of the township were often referred to as west Cambridge, North Cambridge and East Cambridge. Issac Edblad, who was originally from Sweden, came from Wisconsin in 1859 and built a cabin just north of the present Cambridge. Many of the fellow Lutherans who followed shared his cabin while building their own and also used it as their first place of worship. Early settlers in North Cambridge were the Becklins, Hokansons and Bergmans. P. L. Moody came to East Cambridge in 1864. He was followed by the Torells, Rapps, Longs, Lawsons and Andersons. The Forsbergs and Holmbergs were some of the early settlers in West Cambridge. Most of the present town of Cambridge was developed from property belonging to S. S. Bunker, Ira Conger and J. P. Woodman.